Every year after the Onam, the media in Kerala comes up with an area-wise score card – not of marks scored in exams by the students but is of the money raked in by the Beverages Corporation. Kerala has overtaken traditionally hard-drinking states like Punjab and Haryana and we boast of the highest per capita consumption in India – over eight litres per person a year. Also, in a strange twist of taste, brandy is the preferred drink in Kerala in a country where brandy outsells every other liquor. This comes from a stupid notion that the doctors prescribe brandy and is good for health. 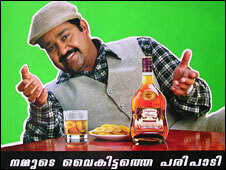 May be in little quantity it may help you, but not in the volumes Malayalees drink. A Malayalee, whether in Canada or back home, on hearing that I retired from the Indian Army, is more interested to know about the “quota” (of liquor) I get, rather than appreciating me for the two decades I served the nation in the most inhospitable terrains and in the most risky situations. The judgements by various courts and the closure of many bars by the state government has added to the chaos in Kerala. It got further complicated with many an allegations of bribes and scandals associated with various political leaders of the state. This has again proved that the legislature and executive never rise to the occasion to ensure that necessary laws are passed and are implemented. Will the public cooperate with the government to ensure that alcoholism does not become a menace, not that it already has become a menace? Let us study a few alcohol related cases and laws as applied in Canada. In the case of Lum v. McLintock (1997 B.C. Supreme Court), a patron spent an afternoon at the bar of a golf club where he was a regular customer. He became very intoxicated. The server knew the patron, knew that he was driving, knew that he was intoxicated and even walked him out to his car. The patron drove off and hit a cyclist causing serious injuries. The conduct of the server was found to have been exceptionally negligent and the licensee was apportioned 30% of the blame (with the 60% to the patron and 10% to the plaintiff cyclist). In the case of Francescucci v. Gilker (1996, Ontario Court of Appeal), a patron had become extremely intoxicated at a restaurant. Staff members picked him up, carried him out to his car, put him in it, and threw the keys on his lap. He drove away a short while later and injured someone in an accident. At trial, the jury apportioned 78% of the blame to the restaurant and 22% to the patron. The Court found that the restaurants conduct was deliberate and reckless. The lesson to take from these cases is that the poorer the job a licensee does of living up to its duty to prevent harm resulting from over-service, the greater the percentage of fault that will be assigned to the licensee in the event someone is injured. In Ontario, the province I reside, it’s a law that If you plan to work in the industry as a Bartender, Server, Manager, you must be certified by law and undergo a training program designed to educate servers, bartenders, managers and other staff members as to what their responsibilities and obligations are under the law, as well as recognize the signs of intoxication and implement intervention strategies for aggressive customers.. Most people know that it’s not wise to serve alcohol to someone who is obviously drunk. But many aren’t aware that they may be sued and held liable. Even at parties at your home and if you serve alcohol, its imperative of you to ensure that your guests who had alcohol beyond the permissible limit are seen off in a cab or the designated driver has had no alcohol. Never permit your guest to carry their drinks off for the road. The laws regarding conveying liquor in vehicle is that no person shall drive or have the care or control of a motor vehicle, whether it is in motion or not, if it is carrying any liquor that is readily available to any person in the vehicle, even if the liquor is packed in baggage that is fastened closed or otherwise. It’s a proven fact that more North-Americans have died as a result of accidents caused by drunk drivers than in the First World War, Second World War, Korean War and Vietnam War combined. The case in Kerala or in India can’t be any different. Though the Kerala government is committed to introduce prohibition in the state step by step, the liquor industry says the step would make their business nonviable, the tourism industry feels that it will drive away tourists from the state. The government is also concerned about its loss of revenue. Liquor is contributing a major share of its tax revenue as the government has been increasing the tax on the booze as part of its policy to curb the consumption. Alcohol helps in giving Kerala’s economy a good high – shockingly, more than 40% of revenues for its annual budget come from booze. Toddy, the traditional beverage of Malayali that even played a role in promoting tourism in Alappuzha district, has of late courted trouble. The Kerala High Court wondered why the state should not ban it, considering the complaints regarding it being mixed with intoxicants. While no one can dispute the intention behind the ruling, can a ban on toddy really halt the rising alcoholism among people in the state? Considering this, it is absurd to expect a ban on toddy to make any significant impact on the drinking habits of Keralites, say those fighting to save the traditional occupation of the toddy tappers. It is not the tapper who adds illicit spirit to the toddy, but the contractor who operates hand in glove with the excise department. The Kerala Agricultural University has developed a technology to extract non-alcoholic ‘Neera’ from coconut trees. The coconut inflorescence sap in its purest form is not alcoholic and contains several ingredients that are good for health, but as it quickly ferments and turns alcohol. The method is to arrest the fermentation using organic methods. Tapping Neera could also fetch farmer bigger returns than toddy and a farmer can earn up to Rs 1500 in place of Rs 250 for every coconut tree used for toddy tapping. The religions unknowingly also plays a part in this chaos. The gospel readings in church masses of how Jesus converted water to wine are given as a justification for many like me to consume alcohol. May be, it was the first miracle of Jesus as recorded in the Bible; it may be worthwhile to remove it from the gospel reading. The Hindu mythology speaks of “Som Ras” believed to have been created Lord Brahma. May be that Islam bans use of alcohol. Recent Malayalam movies have shown the super-star heroes drinking on any occasion – sad, happy or otherwise and then they come out with a statutory warning about the dangers of alcohol. In comparison, I have hardly seen an English movie depicting the hero in an intoxicated state. Strict enforcement and stricter punishments are only the way out. Unlike in North America, where many are afraid to take on to the wheel after a drink, mainly because of the fear of a police ticket, the fines and likely suspension of license. Life without a driving license is the most difficult for the North American barring the people who live in the metros. Further, the moment you get charged, the vehicle insurance premiums shoot up, where as in India, it remains the same even in case you are held liable for a death on the roads caused due to driving under the influence of alcohol.